Mary MacLane (1881-1929), recently rediscovered and winning praise from The New Yorker, The Atlantic, The Washington Post, and many others, was the first of the modern media personalities. A pioneer in self-revelation, in defying established rules, in living on her own terms - and writing it brilliantly - she burst out of Butte, Montana at age 19 with a journal of private thoughts and longings that incited national then international attention. She sold almost 100,000 volumes in her first month, became a gambler and newswoman, in 1918 wrote and starred in the path-breaking silent film Men Who Have Made Love to Me, influenced Gertrude Stein, inspired F. Scott Fitzgerald, sparks theater, stage, and music projects to this day ... yet her still-astonishing public life has remained unknown. Until now. Editor Michael R. Brown, foremost MacLane scholar in the world today, says: "This is the other half of Mary's story, and it's taken decades of research to tell it. She gave herself totally in her writing, and the world's slowly remembering that. She was, among other things, a self-grown 19 year old Surrealist - in America of 1901! - and her writing at its best is incomparable. But the public reaction was just as incredible, and it's never been collected, much less interpreted. Any home she stayed in was swarmed by journalists; clubs of rebellious young ladies formed and the press labeled them 'victims of MacLaneism'; the furor was discussed in London and Switzerland; Mark Twain mused on whether she was a genius; gold mines were named after her - and horses. And prize cattle. Her hometown baseball team. Cigars. Tabasco sauce! When she moved on from New York to Boston, it made the papers all the way to the West Coast. "But this was just the outer fireworks. More deeply, almost every paper or magazine in the country reacted passionately, for or against (and sometimes both). With headlines needing only to say 'Mary,' she was literally a household name, and the content, style, morality, even sanity of her work were debated endlessly. Some of our biggest writers - like H.L. Mencken, the great realist Hamlin Garland (who declared her style perfect), Harriet Monroe (who'd go on to champion Ezra Pound among others) - praised her powers, while newspapers printed mocking poems and hateful attacks. Mary in the Press collects it all, without omission, and lets each piece take its stand. These recoveries range from the papers' single-sentence humor jabs, to news pieces brief and long (from the marriage of her sister - it made national news - to detailed reports on Mary's silent movie), to a chapter-length analysis from 1917, to dozens of letters from across America to Pulitzer's New York paper after it'd hired her to write a few feature articles, to the ugliest attacks, to deeply-seeing analyses, to the preserved words of those who loved and admired her. "It begins with over 120 pages of interviews with Mary and those who knew or emulated her, almost all unseen for a century or more. Her interviews are unparalleled performances in which she expresses her precise, Surreal individualism with absolute spontaneity. They're unlike any other spoken-word records I've ever found, a species to themselves. The collection then classifies each following piece by its posture toward MacLane - so we start with the Laughers, for the mocking and humor, and quite a lot of it, then go to the Lovers, for those who adored, to the Reporters - the largest section, several hundred pages, for the factual-leaning pieces - then through the Haters, the Analysts, the Musers, the Seers, the Artisans (those who've used Mary in artworks), the Obituaries, the Memories (for the reminiscent), Academics, Fictionists, an epilogue of items on her Parents and Childhood, and we send the reader off with several hundred of the newspapers' Squibs, which go from the atrociously banal to the truly witty. "The book portrays not only the profound effect she had, but the age she helped change. “It is almost thirty years since I first found Mary MacLane. She was forgotten, and there was nothing in print on her life. I've worked since to correct these problems. This is the book I wish I'd had at my side when I read those first words." Editor Michael R. Brown is presently at work on MacLane's first-ever biography: A Quite Unusual Intensity of Life: The Lives, Worlds, and Work of Mary MacLane, also calendared for 2015. He published Tender Darkness in 1993 - the first MacLane anthology ever - and in late September 2014 is releasing to print the vastly-expanded 600-page anthology Human Days: A Mary MacLane Reader. Check http://maclanefame.com (under construction) for exclusive content and updates. Regularly visit Petrarca Press' central site http://marymaclane.com for all news about the ongoing discovery of Mary MacLane. 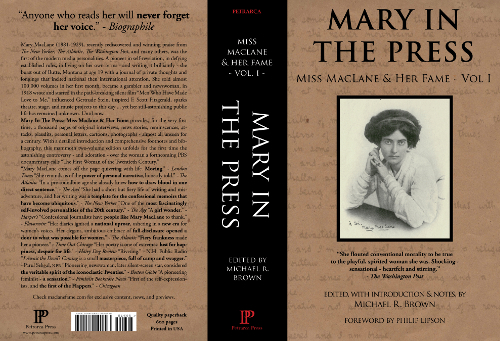 For publication information and pre-ordering for Mary in The Press: Miss MacLane & Her Fame, email groupmail@petrarcapress.com or dial 530-566-6615. ISBN and SAN information forthcoming. © 2014 Petrarca Press. Site. Email us. Valid CSS & XHTML. Design by Arcsin.